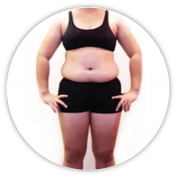 Hereditary obesity refers to the onset of weight problems as a result of one’s genetic makeup. Genetics play an important role in how easily we gain and lose weight; and studies have found that genetics are responsible for at least 50% of all obesity cases. Variations in the genes controlling appetite may cause one to be less able to sense it when they are full. Some genes may make one more responsive to the taste, smell or sight of food. Some genes may affect one's sense of taste, giving preferences for high fat foods, or putting off healthier alternatives. Genes also determine one's metabolic rate. Genes may also affect one's behavior and the inclination towards less active lifestyle choices. Many genetically obese individuals are often the targets of bias and ridicule, and as a result may experience low self-esteem or grow up as an introvert. Genetic obesity also increases the risk of knee pain, diabetes, heart disease and high blood pressure; and makes one feel tired and breathless easily. Genetic obesity may also affect one's chances in life, for instance, when seeking employment. People with obesity-related genes are not destined to be obese. Contrary to popular belief, genetic obesity can be substantially reduced or treated through an active lifestyle and more importantly, professional weight loss treatments.